Last night, during a bout of insomnia (thankfully, a rare occurrence), I Googled Learn Shorthand, and found my way to this overview of various short hand methods. See, I've always had this theory that rather than upgrading the latest device out there, maybe I should just upgrade my brain. I nearly always carry a notepad around, and being able to take notes in it faster and more reliably would be huge. John Robert Gregg devised the most famous of alternative systems in 1888. All lines are of the same thickness, position relative to a line is irrelevant so lined paper is not needed, and awkward diacritical marks are avoided though not abscent. 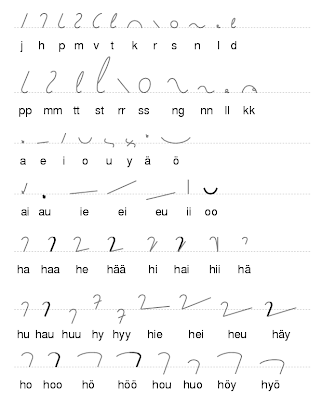 Gregg Shorthand won out over Pitman Shorthand in America, and was widely taught in public schools as an essential skill needed by office workers to take dictation. Many books are available, and most public libraries in America will have copies. Unfortunately, Gregg Shorthand is only a shorthand system; you can only write outlines of words. If you write something and then immediately transcribe it, as secretaries tend to do, then no major problem, but if you try to read something you wrote last year, then a major effort may be needed to decipher it, unless, that is, you have so mastered the system that you can sight read thousands of brief forms. Outlines of words? Thousands of brief forms? Yikes. And this isn't even the most complex system. Pitman shorthand, developed in 1837, "is based on geometrical curves and lines in varying lengths and angles written on lined paper. Lines are also written thin or thick using a special flexible fountain pen tip, though a pencil will work. " Again, yikes. Most systems consist of rules for abbreviating words together with memorized abbreviations. If the rules are consistently applied, they can be reversed to decode your notes. These systems have the advantage of working with both pen and paper, and with keyboards. Word processing software, such as Word, could possibly be set up to decode and expand words as you type which would allow you to speed type. Now we're talking. One of the systems mentioned is Speedwriting, which I realized, I had actually encountered a number of years back. While browsing books at my in-laws house, I found a Speedwriting study guide, which not only explained Speedwriting was all about, but provided exercises you could try out. (Which, to my mother-in-law's credit, she had completed!). I had forgotten, until last night, just how cool the system is. Don't cross t's or dot i's. Of course, there's more, but with just those rules, you can already make impressive gains in how much briefer you can write and type. I also found it helpful to refer to this digram which reminds me how to make cursive lettering (so that's what a capital T looks like who knew?). As a bonus, by using shorthand, your notes will almost certainly be illegible to others. It's about as secure a system as rot13, but should keep most prying eyes away. All of a sudden, the abbreviations teens have come up with for texting, take on a whole new meaning and value. Not to long ago, these kids would have had to take a course to teach them shorthand, instead, they've invited their own. Update: Two useful resources: (1) A comparison between handwriting vs machine transcript, and (2) a video of someone doing shorthand at 100 words per minute. Amazing, I can't imagine how one does that! (That's using the Handywrite system, not the Speedwriting from above).